When we last heard from Tom Waits, he released a theatrically-charged double album, Franks Wild Years. It was the culmination of a trilogy characterized by dark lyrics, unorthodox arrangements, and, at times, bizarre instrumentation. But amidst all that chaos, the taxonomy of Waits' progression was at least vaguely recognizable. Sure, these weren't the Waits' jazzfolk records of the 70s, but we still hear brass sections and beatnik deliveries that earmark the songs as distant cousins of the old stuff. Then came Bone Machine, and album that represents yet another sea change in the man's aesthetic. It blends dystopian dirges with soothing balladry. It offers minor key gospel, spastic, dark reapers and--would you believe it--a few straight rock tracks. Indeed, Bone Machine was beautifully fractured, featuring an uninhibited--and at times, downright silly--Tom Waits playing the music he wanted to play. Songs to Know: Need proof that Bone Machine is chock full of oddities? 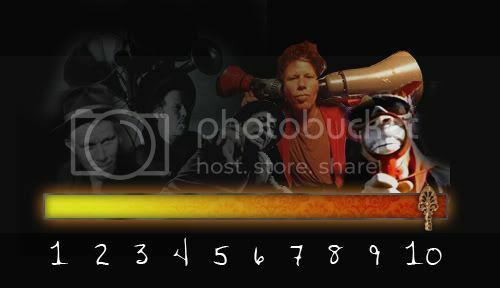 Look no further than the cover.Yes, that's Tom Waits--wearing goggles and a cap with devil horns. Seems kind of silly and juvenile yet suitably Gothic. This proves to be a fitting reflection of the music contained therein. We see the rise of some latter-era Waits idiosyncrasies: Sneering, bullhorn-filtered vocals; eerily textured spoken word pieces; and exquisite folk balladry. The two opening cuts ("Earth Died Screaming" and "Dirt in the Ground") drip with gloom and pessimism, and you wonder if you're in for an album's worth of the same. But not all of Bone Machine's tracks echo these dour themes. In fact, Waits' ballads are a large part of his late period appeal. If there's a larger criticism of his recent music, its that there are too many experiments; that his albums are diluted by his apparent desire for unconventionality. 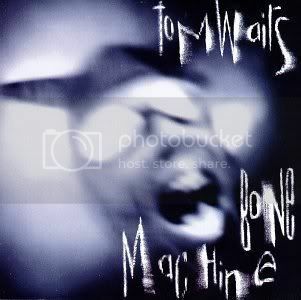 The AV Club's Noel Murray wrote that Waits "has the irritating habit of coming up with achingly beautiful melodies and tender lyrics and then bellowing them through a megaphone in a Tasmanian Devil voice, as though he didn't trust his listeners to be left alone with mere sentiment." The Highland fiddles and sorrowful pedal steel make this one of Waits' most tender, poignant ballads. "A Little Rain" and the album-closing "That Feel" round out the album's softer side--the latter a Keith Richards co-write. You may actually recognize a few of Bone Machine's cuts. If you're a Ramones fan, you've probably heard their version of "I Don't Wanna Grow Up", Waits' rollicking brush-off of responsibility and the drudgeries of aging. It's striking how jovial he sounds, compared to the likes of "Earth Died Screaming" and "Dirt in the Ground." "Goin Out West"--a devil-may-care stomp that sees Waits' howl "I got hair on my chest/I look good without a shirt!" --was featured in the film Fight Club. If you have a moment, scroll back and listen to "Martha" from Closing Time before you check out "Goin Out West". Yes, it's the same guy. 10: I think this is proving ground for Waits' fans. There's so much going on over the course of Bone Machine; plenty of opportunities for none-the-wiser listeners to be scared off. It's certainly not an easy album. Start with the ballads, then inch over to the likes of "Going Out West" and "I Don't Wanna Grow Up"...and then sample the rest at your own risk. Just remember, I wouldn't recommend "In The Colosseum" as your first exposure to Waits. Also Check Out: If you listen to Bone Machine and find that you're strangely drawn to the oddball stuff, then might a recommend the Bastards disc of Orphans--his 2006 three-disc collection of unreleased/scattered material.